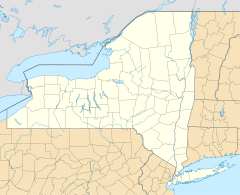 Genesee Valley Park is located in the south side of Rochester, New York along the shores of the Genesee River. The New York State Barge Canal (the currently in-use portion of the Erie Canal) crosses the Genesee River within the park. The University of Rochester is located near the park's north entrance. The park was formed from land first acquired by the Park Commission in 1888. Genesee Valley Park is among the many parks in New York state designed by Frederick Law Olmsted. Within Rochester, other Frederick Law Olmsted parks include Highland Park and Seneca Park. Olmsted had originally designed the east and west sides of the park to have different purposes. The east side was intended to provide the feeling of a large pasture while the west side was for more recreational activities. At Olmsted's suggestion, a flock of 80 sheep was introduced into the park in 1893, which added to the pastoral sense of the park and also helped to keep the grass trimmed. In 1917, the golf course was expanded from 9 to 18 holes. The Barge (Erie) Canal was merged with Genesee River within the park on May 10, 1918. With the opening of Genesee Expressway (now part of Interstate 390), the park was bisected straining the original pastoral atmosphere. Genesee Valley Park covers 800 acres (3.2 km2) and features two public golf courses and a recreational area. The park has four foot bridges crossing the Genesee River and Erie Canal, and is located at the intersection of the Genesee Valley Greenway trail and the Erie Canal towpath trail, which stretches across New York State. ^ a b "Genesee Valley Park". Monroe County Parks Department. Retrieved November 27, 2016. ^ "Genesee Valley Park (South Park)". Vintage Views of Rochester. Archived from the original on February 21, 2012. Retrieved August 13, 2016. ^ "Rochester's Olmsted Parks - About the Park System". Landmark Society of Western New York. Archived from the original on September 14, 2011. Retrieved August 13, 2016. ^ a b c d Wickes, Majorie; O'Connell, Tim (April 1988). "The Legacy of Frederick Law Olmsted" (PDF). Rochester History. Rochester Public Library. L (2). ISSN 0035-7413. Retrieved December 29, 2007. Wikimedia Commons has media related to Genesee Valley Park. This page was last edited on 6 September 2018, at 05:05 (UTC).